Hello! My name is Sam and I love to crochet! Phew, I’m out of the Crochet Closet…that feels better. I live in a lovely village a couple of miles from Barnstaple in North Devon with The Mr, our 2 kids – Missy (12) and Matey (10) – and our delinquent black Labrador, Milo. When I’m not keeping that lot on track, or doing my day job as a Teaching Assistant, I’m usually crocheting. You can find out more about me in this interview by Joanna of Adventures and Tea Parties. I like to point people to this interview because I was chuffed to be chosen to do it. I started my blog to share my crochet makes but have since taken a liking to creating my own patterns and writing tutorials. I’d like to develop it further by collaborating with other crafty beings and getting involved in bigger projects. Do get in touch if you think you’d like to work with me or you have a product you’d like me to review. Oh! 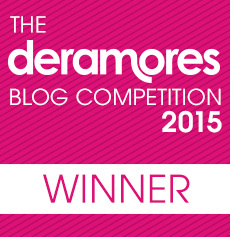 and I just won the Deramores Blog Competition 2015 with this post about Colourful Ombre. Super chuffed about that one too! Thanks Emma, obviously you’ll be the chief yarn supplier! Thanks for following my blog! I love your projects! We have a lot in common. Your letters on your projects are encouraging. 🙂 Cheers.